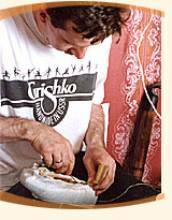 After the sole has been stitched to the shoe GRISHKO masters start the process of hammering the pointe shoe box (working the shoe with a specialized hammer) which they repeat twice. In our factory this is all done manually. In the first stage the master spreads paste around the inside of the damp box, so as to prevent lumps forming and to be sure that all the layers are evenly glued. That way the box has even thickness and is equally strong on all sides. If the customer prefers we can make the wings of the box thinner. After the sole has been stitched on and the pointe shoe turned inside out, the master hammers the shoe box again, leveling the whole area and polishing it on all sides. Special care is given to the platform – it is adjusted with mathematical precision down to the last millimeter. The edges of the platform which have to be accurately shaped, are balanced and smoothed to perfection. It is the upper and side borders that are vital for the stability of the pointe shoe. 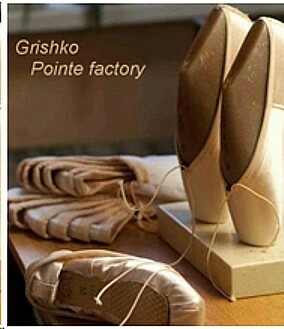 GRISHKO pointe shoes are designed with highly qualified technologists working with researchers and scientists to ensure that pointe shoes are the best possible for your feet, your performance and your health. As the great ANNA PAVLOVA said – A Pointe shoes made by her cobbler gave the shoe his heart and soul.